My synthpop project Eurotix is back! 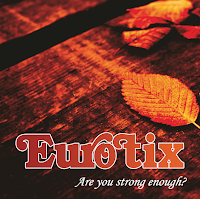 The brand new EP "Are You Strong Enough?" features four synthpop songs, including the title track, a powerful synth-ballad. Check out the official video for it, directed by Israel Benavides and Gävle Collective Film, down below. Please share it with your friends! The EP is out digitally on iTunes, Spotify, Amazon UK, Amazon US and many other digital music stores. You can still order CD editions of our debut album "The Secret" from our official website. Thanks for all your support! More coming soon, so watch this space. Listen to "We Have Built A Satellite (To Make It Crash)", the final track on Eurotix debut album "The Secret". If you like what you hear, the song is available digitally on iTunes, Spotify, Amazon UK, Amazon US and on a limited CD edition. By the way, we're releasing our brand new EP "Are You Strong Enough?" later this month. If you can't wait, Club 80's will premiere some of the tracks tomorrow. The show starts at 9 PM CET and you can listen live on the radio station's website.